Finally, Skype on my iPhone! I’ve been waiting for an app that would allow me to make Skype phone calls from my iPhone.! And it is here… woo hoo! 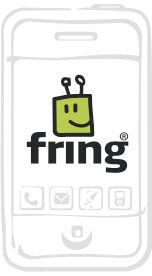 It is called “Fring” (and it is now an accepted terminology to use the word “fringing”!). It not only allows you to make Skype calls and do Skype chats, but also integrates with MSN Messenger, Google Talk, Twitter and a whole lot of other chatting services. Check out the Fring site for more. Installing it was a breeze. And the interface is really nice and simple. It uses WiFi to make Skype calls. So if your phone is connected to WiFi, you can make Skype calls. Fring is also available for other handsets like Wi-Fi Symbian 8 or 9, Windows Mobile 5 or 6 and UIQ. Until I saw the WiFi comment, I was like there is NO way that the iPhone EDGE network is fast enough to handle voice of IP functionality 🙂 I like my iPhone but the connection speed is garbage. oh so u got your hand on iphone too! ishak already got one for himself. i’m waiting for the 3G version hehe.